This is the view over the grounds immediately in front of Lodge Park taken from its gallery. 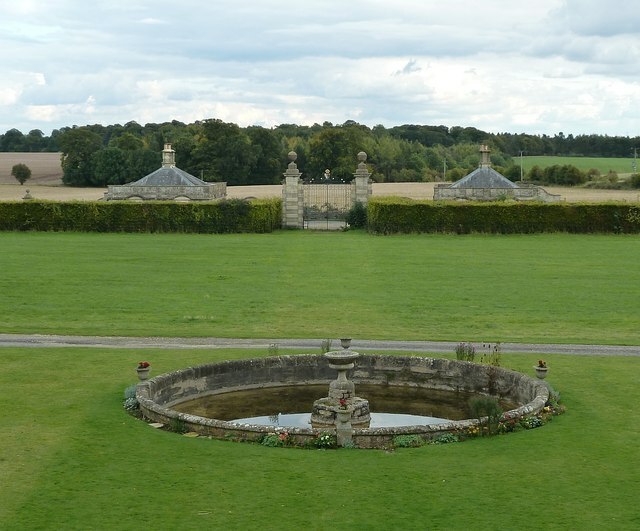 The circular pond would not have been there when the grandstand was built in the mid C17th as the purpose of the building was to have a good clear uninterrupted view of the "finishing line" for deer coursing that was held here (see shared description below). Lodge Park has the interesting claim-to-fame of being the first restoration project to be undertaken by the National Trust, in 1998. This little building was originally created for John 'Crump' Dutton - owner at the time of the nearby Sherborne Estate - to facilitate his passion for deer coursing, gambling, banqueting and entertaining. The first floor gallery and roof terrace both allowing a grandstand view of the deer and dogs crossing the "finishing line" of a mile long course that had approached in a dead-straight line from the north-northeast. The National Trust used archaeological evidence to return the building to its former state as a grandstand, as it had been extended and converted into a house by King for Emily Theresa, Lady Sherborne in 1898, and had subsequently fallen into disrepair. The original grandstand was probably designed by John Webb (Cf. Lamport Hall in Northamptonshire) but was executed by Valentine Strong of Taynton. Lodge Park is open March to November, Fridays to Sunday and Bank Holiday Mondays. Note that it is occasionally closed for private functions.